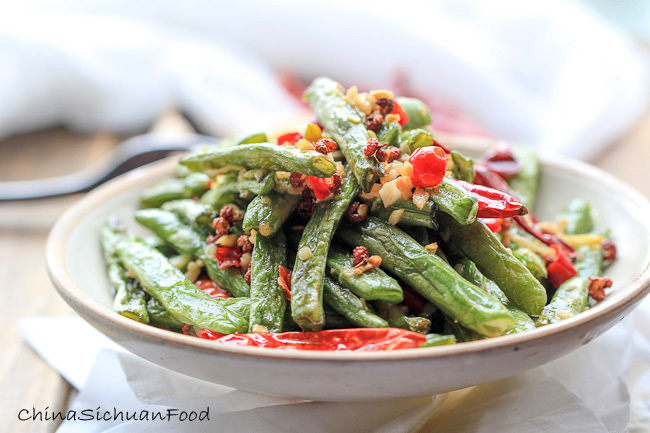 Szechuan Dry fried green beans (干煸豆角) is very popular in Chinese restaurants. However, many of my friends complains that it is difficult to make a successful one since they either over fried the green beans to burn or the green beans are not fried enough. 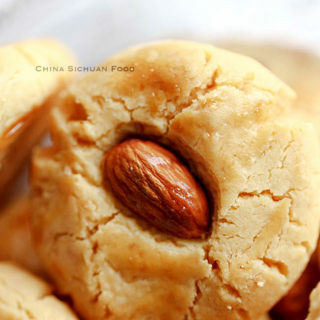 Dry frying is a cooking method we commonly use in different Chinese cuisines. Comparing the sautéed recipes, more oil is needed in the pan but less oil is needed comparing with deep frying. 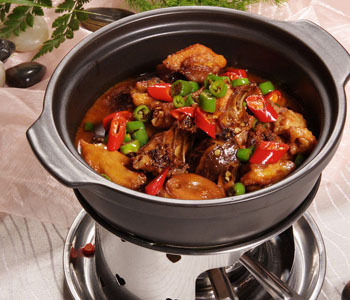 They are still other famous dishes such as Szechuan Dry-fried beef shreds (干煸牛肉丝) etc. 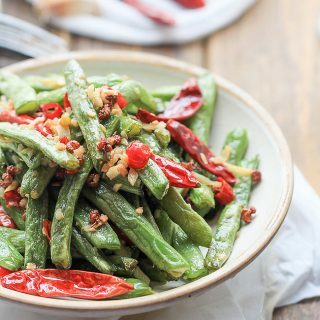 Traditionally, green beans are deep fried to remove the water and then stir fry with dried peppers and Sichuan pepper. If you do not want to use that amount of oil, boil the green beans in hot water for several minutes firstly. I use pan-frying with a little bit more oil instead of deep-frying because the less oil version is healthier. But pan-frying need more time. The less oil you use, the longer the process will be. Put the green beans in a pan to stir-fry for around 2~4 minutes to remove the water(No Oil in this process). And then add 4 tablespoons of cooking oil to fry for another 7~10 minutes(and during the process, the skin of the green beans will begin to be crinkly ). Besides garlic cloves, dried peppers and Sichuan peppercorn, I also call for Sichuan pickled chili peppers. 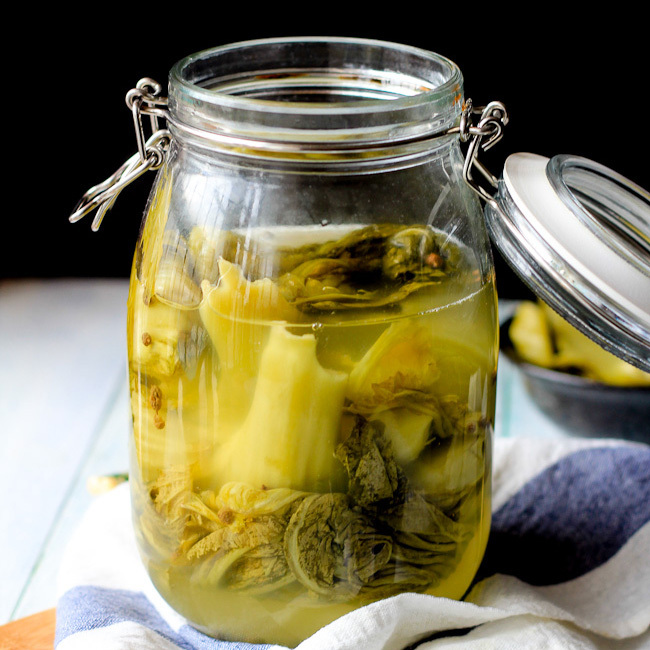 If you are interested in making some at home, check pickled vegetables-Sichuan style or just replace it with fresh Thai chili peppers or skip this ingredient. 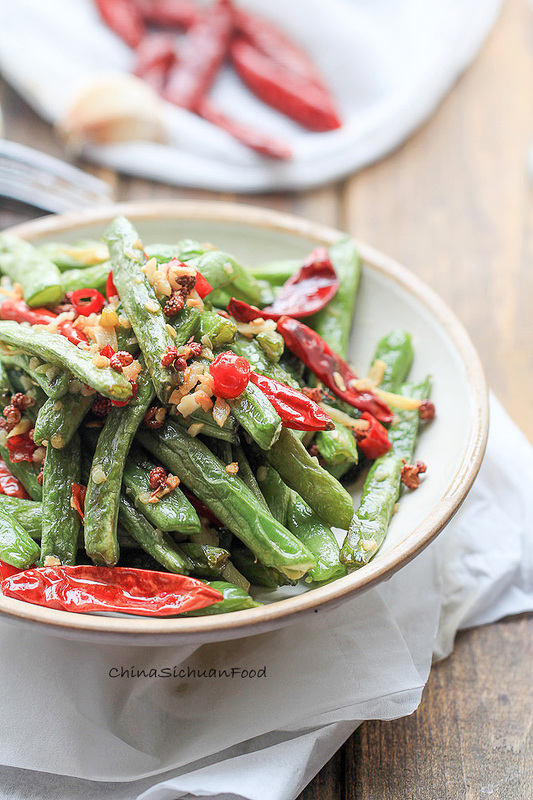 After stir fry the seasoning until aroma, return the pan-fried green beans. Add salt and mix thoroughly. 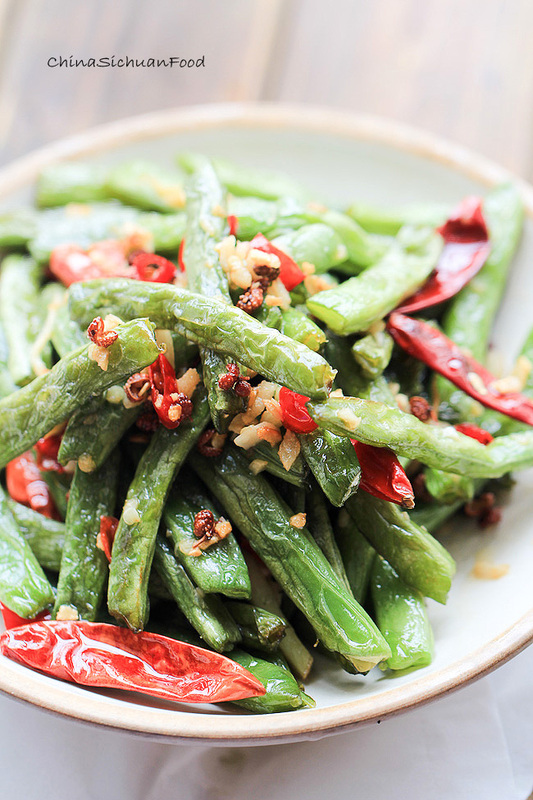 The fresh taste of green beans gives a comparison with the dried condiments and persevered vegetables. The savory hot is always one of my favorite tastes. I am serving this dish with a large bowl of watermelon salad. 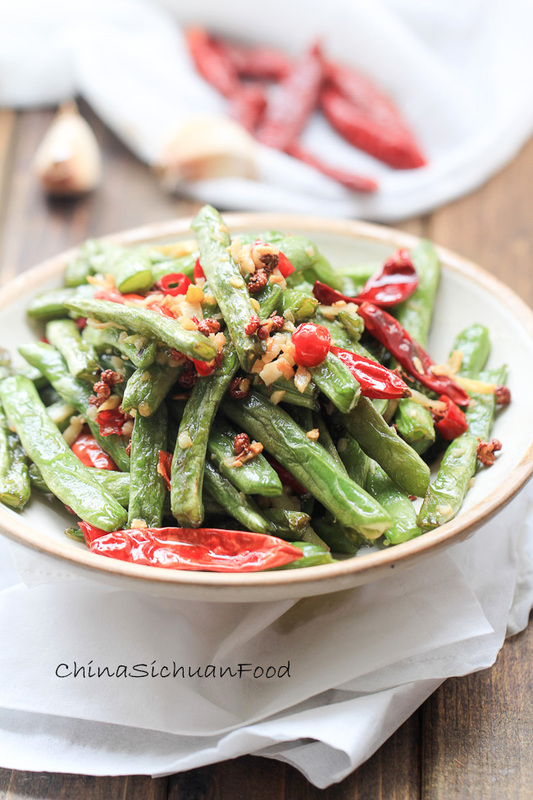 Healthier Sichuan Style Green beans also known as dry-fried green beans. Cap the fresh green beans; Wash and drain. Heat up pan without oil and then put green beans into pan for frying the water out around 2 minutes to remove the water on the surface. Add around 4 tablespoons of cooking oil in the pan and continue to dry fry until the skin of the green beans become to wrinkle. This process may need 8~10 minutes. Move the green beans out of the wok and set aside. 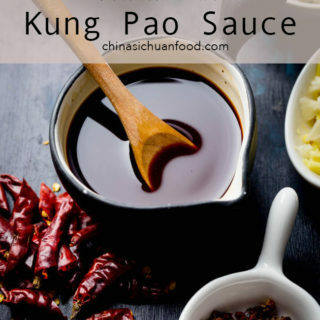 Transfer exceeded oil out and remain around 1 tablespoon in wok, add dried red pepper, Sichuan peppercorn, garlic, ginger and chopped pickled chili peppers to stir fry until aroma. Return dry fried green beans and add salt. Mix well. 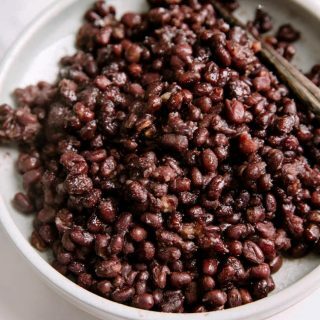 If you want to add some protein, you can add minced pork or beef into this recipe. Stir fry minced meat before adding the fried green beans. Thanks very much for this recipe. One of our top 5 dishes. 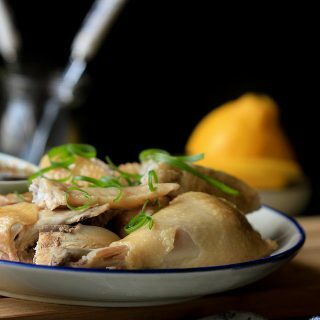 We lived in China for 12 years, and for many of them, had this daily for lunch. We always ordered this when we had visitors come to China. It was something that they were unaware existed, but wow, they sure loved it. I took cooking lessons in a Sichuan restaurant in a BJ hotel, and we made it – and dan dan noodles. But since then I have forgotten and cannot find my notebook. So I am glad to see this and will try it very soon. Your website is great. I looked through it for quite a while. I assumed you were living in Canada or the US, or UK, but came from Sichuan. Finally I read the “About” and see that you are still living in China. Great job!!! You relate very well to the West and products that are hard to find here. Thanks for your commenting. It is just too encouraging. 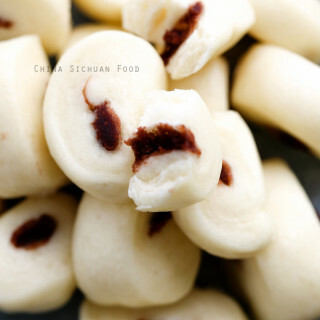 I lived in Sichuan province around 18 years and then in other places of China always with the interest of searching for different yummy dishes. I love to cook different foods and really happy to share them out. 谢谢 Fred for your lovely comment again. This is one of my favorite dishes of Chinese food. And green beans are great, thanks for the recipes! You are quite welcome. Jessica. This is my favorite too. Yummy green bean recipe, thanks for sharing. Glad to hear you like it Amallia. This is my absolute favorite Chinese dish! 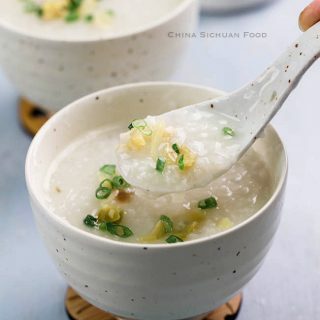 I ate it every day while I was in Shanghai last time and now I can make it at home! Thanks for the inspiration. I will order this every time when I eat in Sichuan restaurants and make them from time to time at home. Enjoy and nice day ahead. I would recommend using medium high firstly and slightly slow it at the later frying part, otherwise, the beans might be burnt. I made it and it turned out delicious! I added a dash of soy sauce and Chinese rice wine. I didn’t have dried Sichuan peppercorns but I used Sichuan peppercorn flavored oil which imparted a nice kick to the dish! What do you mean by “pickled red pepper”? The pickled red pepper is known as 泡椒 (Pao Jiao) in Chinese. 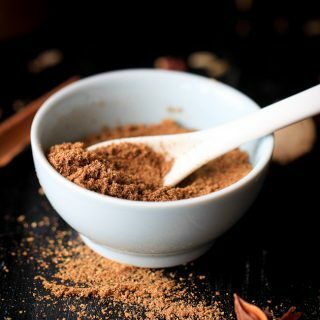 It is one of the most popular seasonings in Sichuan cuisine. I will introduce homemade recipe later. It turned out delicious! I added a dash of soy sauce and Chinese rice wine. I did not have Sichuan peppercorns but used Sichuan peppercorn flavored oil, which imparted a nice kick to it! What do you mean by pickled red pepper? Do you mean pickled radish? Pickled red pepper is an really important Szechuan seasoning. Fresh red peppers are pickled with salty water and then create a unique pickled sour taste. I can’t wait for your homemade recipe for pickled red pepper. I don’t think I can get it in the Chinese grocery store in the US. 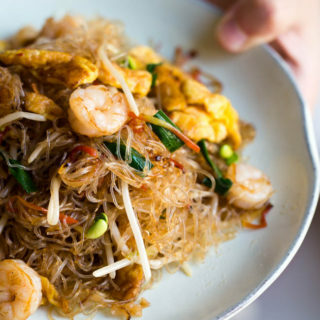 This dish is one of my favorites and I want to learn how to make it with an authentic taste and all the traditional yummy ingredients. I am planning to open. I have send you an email. Let’s contact via Email. Hi,There! I will try the healthier version of preparing this dish,tonight. I deep fried string beans a couple of months ago and it was too oily.